A real-life interpretation of The Italian Job has led to an Edinburgh-based Italian restaurant group being shortlisted for a major industry award. 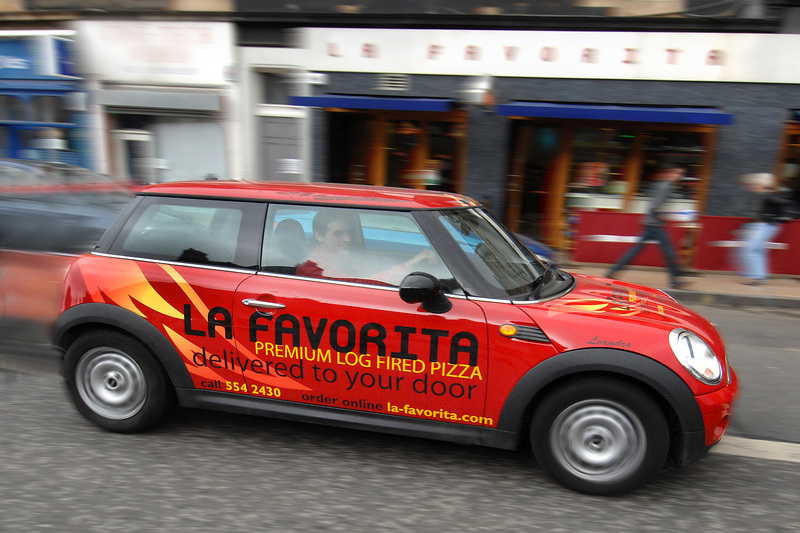 La Favorita, on Edinburgh’s Leith Walk, has been shortlisted for Independent Delivery Operator, as well as Pizza Restaurant, award at the Pizza and Pasta Association (PAPA) Awards which recognises the best and most genuine Italian restaurants in the UK. The restaurant invested thousands of pounds on a delivery fleet of five Minis after watching the cars in action in the Charlize Theron action flick. Tony Crolla, Proprietor of the establishment which opened in 2005, said: “We are absolutely delighted to have been shortlisted for these prestigious awards. “We have invested heavily in developing La Favorita over the past year and this has paid off. “One of our major investments was a fleet of Minis for our delivery staff. “In the film the Italian Job, Minis are used as speedy getaway cars. It seemed apt therefore that an Italian restaurant could use these vehicles for nipping about town with deliveries. It was a fun idea but one that has paid off. With their personalised number plates we now have an instantly recognisable, up-market fleet of delivery vehicles. In 2005 and 2007 La Favorita won gold at the PAPA Awards for Pizza Restaurant and in 2005 Tony was named Pizza Designer of the Year for his fishy Pizza Favorita which included ingredients such as smoked salmon, caviar, crème fraiche and lemon rinds. La Favorita’s sister restaurant Vittoria is also celebrating after being shortlisted for Italian Restaurant of the Year in the Scottish Restaurant Awards. The original Vittoria restaurant, on Leith Walk, was opened by Tony’s parents Alberto and Dina in 1970. It has since become an institution among Edinburgh diners for its good food and lively atmosphere. Last year Vittoria also opened on George IV Bridge. The PAPA ceremony will be held on November 13 at the Royal Lancaster Hotel in London and the winners of the Scottish Restaurant Awards will be announced on January 27 at the Kelvingrove Art Gallery in Glasgow. Tony added: “Being shortlisted for these awards is a fantastic end to a fantastic year for the Vittoria and La Favorita restaurants.